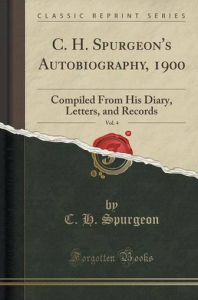 Having finished the fourth and final volume of this classic autobiography of the great English preacher, I felt as though I had watched Spurgeon grow up, serve God greatly in his generation, and go on to his reward at the early age of 58. This last volume (written mostly by family and associates) covers much of his travels to the continent and very much on his reading and writing habits. He was a prolific reader and could comprehend paragraphs as most people comprehend sentences. “Mr. Spurgeon was a very quick reader, but the rapidity of his glance at the page did not interfere with the completeness of his acquaintance with its contents. He could read from cover to cover of a large octavo or folio volume in the course of a very short space of time, and he would thus become perfectly familiar with all that it contained. . . . He would sit down to five or six large books, and master them all at one sitting. . . . He made a point of reading half-a-dozen of the hardest books every week, as he wished to rub his mind up against the strongest minds.” I include this testimony because I have seen the outlines Spurgeon used to preach, a simple few thoughts on a small sheet of paper. But I think his mind was so filled with the Scripture, illustrations, and analogies, that he could speak for any length of time in a very interesting way. He once admitted that he had read Pilgrim’s Progress at least a hundred times, and said he had read all of Shakespeare’s plays, and some of them many times. Spurgeon was also acquainted with a large number of important and famous people. Just in this volume alone we read of his contact with D.L. Moody, Ira Sankey, A.J. Gordon, A.T. Pierson, Florence Nightengale, W.E. Gladstone, George Müller, and A.A. Hodge. Even among these men Spurgeon was a strong proponent of “Disestablishment,” “liberating the bride of Christ from her dishonourable association with the State.” I also appreciated his comments against theater, fermented wine, and evolution, among others.